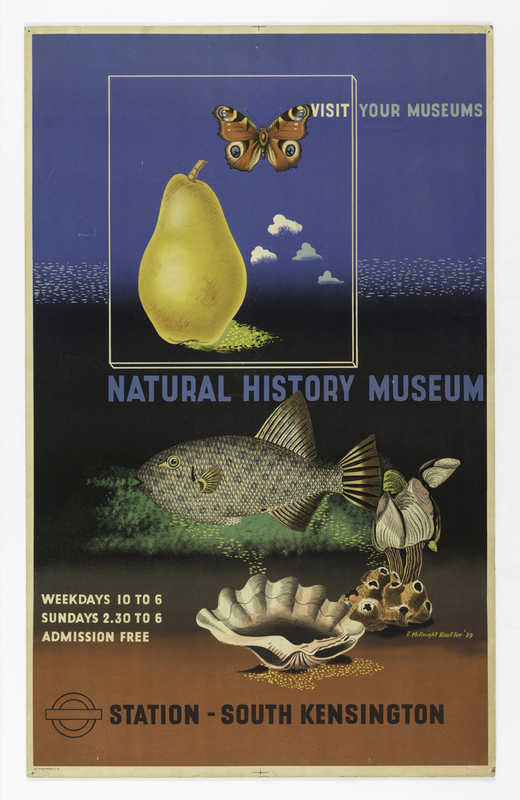 See more objects with the tag fish, public, graphic design, advertising, travel posters, shell, museum exhibition, underwater, exhibition poster. See more objects with the color darkslateblue saddlebrown tan darkslategrey peru or see all the colors for this object. This is a Poster. It was designed by Edward McKnight Kauffer and made by Edward McKnight Kauffer and printed by The Curwen Press and made for (as the client) London Passenger Transport Board. It is dated 1939 and we acquired it in 1963. Its medium is lithograph on paper mounted on board. It is a part of the Drawings, Prints, and Graphic Design department. Printed in brown ink, lower left: 39/21G/PROOF/C.P.